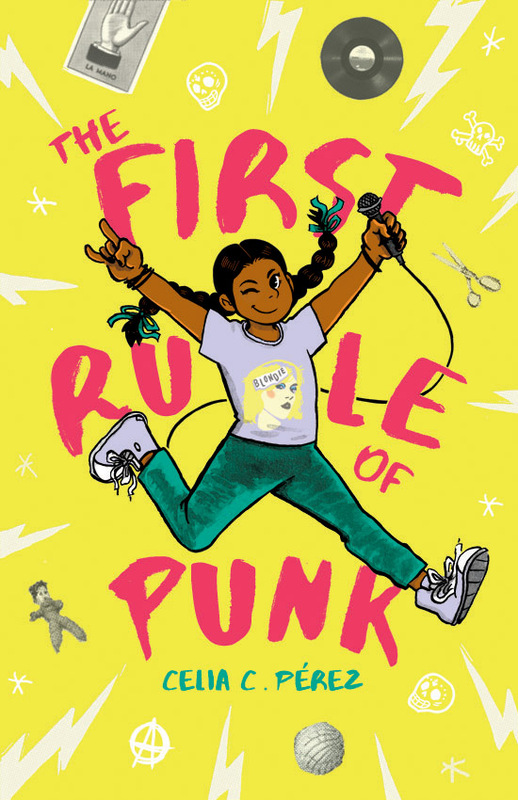 The recipient of last year’s CXC Emerging Talent Award discusses drawing a ‘Descendants’ graphic novel for Disney, editing the ‘La Raza Anthology,’ creating comics on Twitter and much more. Last fall Kat Fajardo received the CXC Emerging Talent Award for her work as both a creator and member of the comics community. She’s the woman behind Bandida Comics, and Gringa, and contributed to Dirty Diamonds, Symbolia and other anthologies and magazines. 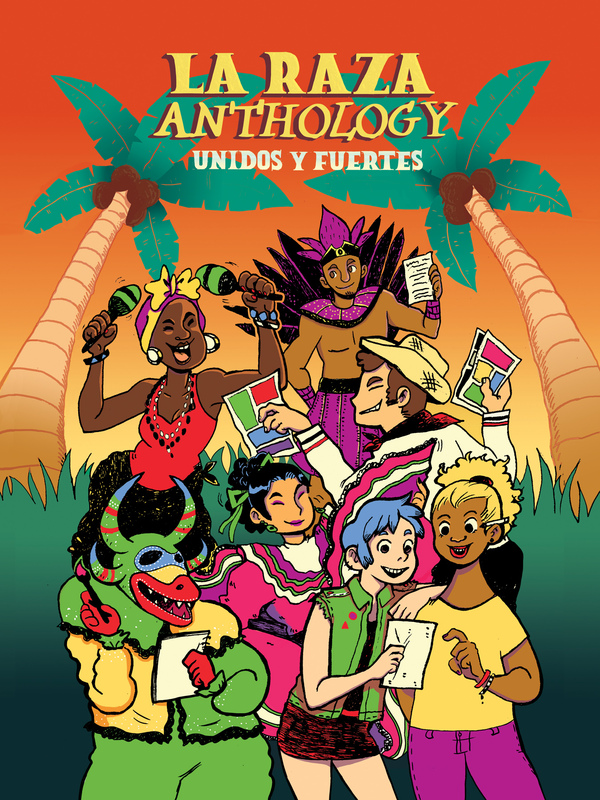 Fajardo also co-edited and contributed to the anthology La Raza: Unidos y Fuertes. More recently, Fajardo has been drawing diary comics, which she’s been posting on Twitter. Fajardo drew the comics adaptation of Melissa de le Cruz’s novel The Isle of the Lost, which is out this month from Disney/Hyperion. She’s also a contributor to the anthology Tales from La Vida. I reached out to ask about her work. I like to ask as a first question, how did you come to comics? When I was younger, I was fortunate to have an older sister with a large collection of Archie Digest comics which I would occasionally steal and read everyday. Soon enough, I was introduced to CLAMP manga at a nearby Barnes & Noble. I was so obsessed with their series that I was inspired to make my own “manga”. I would take small notebooks with me everywhere even on family vacations and create my own original characters. It didn’t occur to me that I can choose comics as a profession until senior year of high school when I had to make a decision for colleges. I couldn’t figure out whether I wanted to do animation or comics at the School of Visual Arts so I took a chance and went for Cartooning. Thankfully it was the right decision (I don’t have the patience for animation). After SVA, I’ve started working on autobio comics and zines while working at a cafe. Shortly after posting my work Gringa online, my agent Linda Camacho reached out to me after seeing my work and the rest is history! What’s the story behind La Raza Anthology and what was it like editing a book? So after years of attending mainstream and indie comic conventions in the East Coast, I was very disappointed with the lack of Latinx narratives in the industry. Despite having created a couple zines based on my own experiences as a Latina, I was craving for more contemporary Latinx stories. So I figured, if I can’t find any, why not start an anthology? After much convincing by my partner Pablo Castro, La Raza Anthology was born! With the help of social media, our call-for-submissions post for comics, illustrations, short stories & poems about Latinidad had great success online. We were able to narrow down our contributor list to around 30 creators from different parts of the world and we were able to successfully fund our book on Kickstarter. After the crowdfunding success, what followed after was a series of unexpected obstacles. What people don’t tell you about having a Kickstarter project is that it’s a full-time gig. Not only do you have to be on top of communicating with 30+ contributors in Spanish and English, but you also have to put together a book while editing people’s work based on their different schedules. Because it was our first Kickstarter project, the cost of supplies and shipping costs were severely underestimated, especially international orders. In addition to my full time day job, I struggled to find money and time to ship out people’s rewards each week. Even though it evolved into pure madness in the end, it was a valuable learning experience for any future projects. I don’t regret any of it, in fact I wish to work on a second volume (maybe using outside help this time!). I’ve had so many creators & readers share their beautiful stories of their own journey with their Latinidad, books like La Raza are important resources to have around. I like short comics because it’s a great way to get a specific message out to readers short and sweet! Back in SVA we would have weekly assignments for short work so it’s a method that has been drilled into my brain. It’s also a really practical way to produce affordable books in a short amount of time before convention season. I can’t tell you how many times I’ve finished last minute comics a week before a convention and assembling books on the car ride there! Short comics are life, however I’m currently working on my first solo graphic novel which will be written and drawn by me so it’s definitely going to be different than my usual short work. One thing that interests me is that a lot of cartoonists will make, especially when they start their careers, autobio work. How helpful is that in terms of finding your own voice as an artist. Because as a reader it feels like I’ve been watching you develop as an artist as you’ve been understanding what it means to you to be Latinx and Honduran. Is that fair? Oh totally! I think what’s alluring about autobio work is the idea of having a safe space where you can reflect on your thoughts and feelings. It’s a therapeutic way to explore that voice while having a place to also address important topics like mental illness, disabilities, queerness, political issues and race. It’s a great way for readers to experience the artist’s life and personalize certain issues unfamiliar to them. Creators like Breena Nuñez Peralta, Kevin Budnik, Bianca Xunise, Laura Park, Ben Passmore, Laura Knetzger, Julia Kaye and many more have created comics that have invited readers into their personal world. Working in this genre has definitely helped me come into terms with my own identity as a Latina and reconnect with my roots for sure. And I’ve had the great opportunity to meet so many kind folks who have seen themselves in my comics, which totally makes my day. 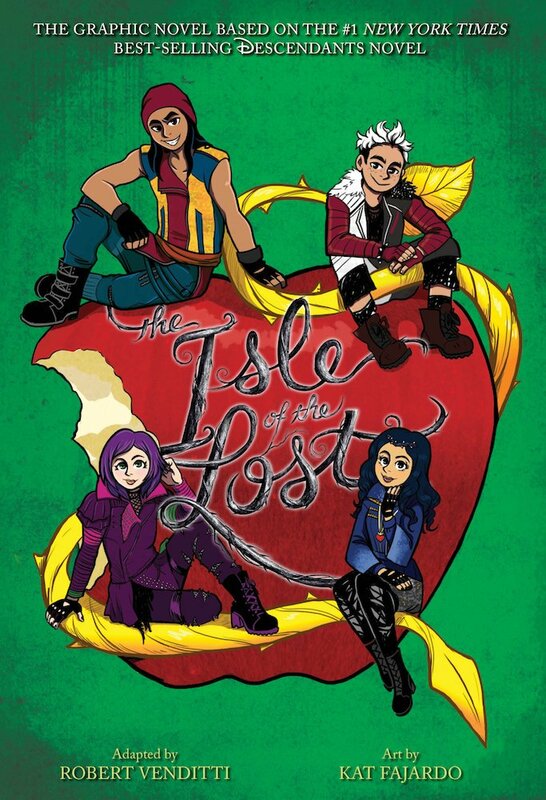 You’re also illustrating an adaptation of Melissa de la Cruz’s The Isle of the Lost, which comes out in September. Do you want to say a little about working on the book and the particular challenges in this book and comics for kids? Yes and I’m incredibly excited for it! As a huge fan of the Descendants series, I had put a lot of pressure on myself to get the adaption’s look just right. I didn’t want to disappoint anyone, especially Melissa De La Cruz and Robert Venditti (writer for the GN). Because I’ve been working on self-published projects for years, I wasn’t aware that working on a licensed series with a big company was a whole new ballgame. Working with the Disney Channel and their editors, I had to make sure all of the characters and their costumes were perfectly on model. If the characters looked any different in the comic, I had to go back and change it before the coloring stage, while juggling other tasks like editing model sheets. Because there were so many people on editing duty, there was constant back and forth communication and editing input, so I had to be vigilant of emails. Luckily I hired a great team of talented artists to help me out, specifically Leigh Luna as lead letterer and colorist, followed by the flat coloring team Madeline McGrane and Andrea Bell. Without them, the book definitely wouldn’t have been made or at least wouldn’t look as amazing as it does now. Despite the obstacles, this project has been an essential learning experience and milestone as a professional cartoonist. How much of what you do is illustration vs comics or other work? This year I find myself focusing more on comics than illustration work. Although I occasionally make illustrations for YA projects, I have a harder time coming up with things to draw for myself. As a cartoonist, comic ideas come to me much more easier and I love creating informative work. But because I have recently set up a Patreon site, I now have an excuse to produce as many sketches as I possibly can per week. It’s great practice to get back into illustrations. What’s your process and how do you like to work? Are you all digital? So my work process starts off with intensive thumbnailing and sketched out pages. I like having dramatic page layouts and splash pages, so planning them in advance is a must! Depending on the project, I tend to switch up my process for inking and coloring. For my own self published zines, I ink traditionally with some occasional ink wash or digital coloring. Because these comics are meant to be more experimental and made initially for myself as diary comics, perfection is the last thing on my mind. And as for YA books and client work, I prefer a more polished look by working completely digitally on my drawing tablet. But for my next GN, I really want to integrate the two styles. 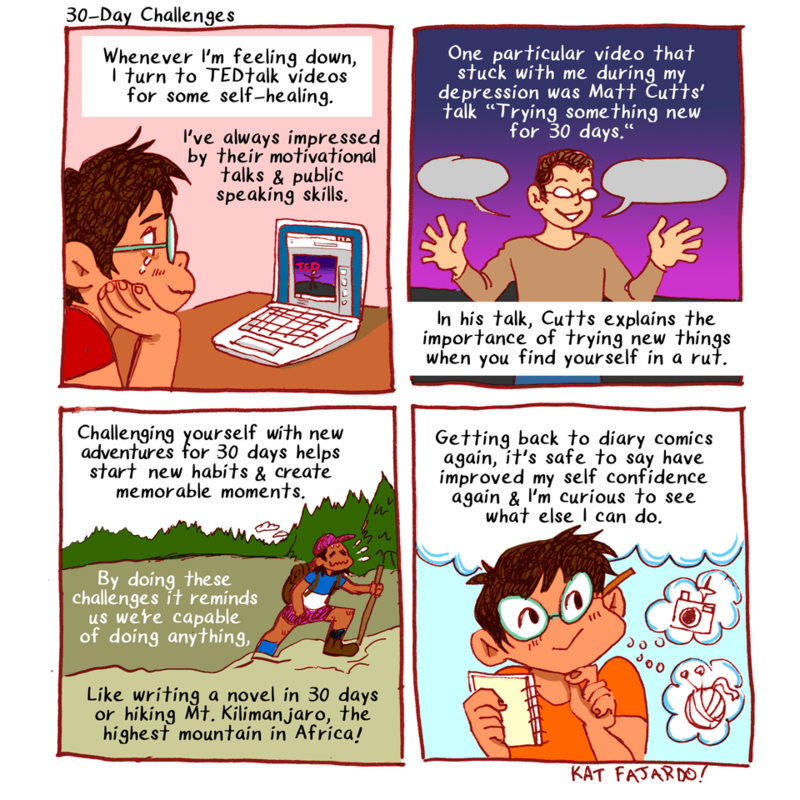 You’ve been posting comics on Twitter and you did a 30-day diary comics challenge. Why did you give yourself that challenge and what was it like? Well after months of working nonstop on The Isle of the Lost while also working at a cafe, I did a terrible job of taking care of my mental health. So when the project came to an end and I finally quit my day job, my life sort of just froze. Suddenly all of my past trauma and self-esteem issues began flooding into my everyday life. I fell into a terrible depression and for weeks I couldn’t get myself out of bed. Until I finally had a breaking point where I realized something had to change in my life in order to feel normal again. After days of sitting through various self-help vlogs and TedTalk videos on Youtube, I came across Matt Cutts’ talk “Trying something new for 30 days”. In the video Cutts explains how trying out a new challenge might help folks when they find themselves in a rut by forming new habits while rebuilding their own self confidence. As a person who loves challenges, I saw Cutts’ example as a great first step to rebuilding my mental health. I needed to start small so the logical thing to do was getting back to doing autobio comics again, which I had neglected this past year in order to work on Disney project. And so far it has been a great experience! Having a daily routine really helps alleviate depression and I felt well enough to leave the house and see a therapist. At first having a daily comic schedule was fun and easy because it felt refreshing, but after the first week it became a bit difficult. There are days when I’m feeling too tired to work or I’ve been too busy with errands all day, that I’d have to rush to my studio and get the work done that night. But after realizing the challenge doesn’t have to produce perfect comics but rather getting into the habit of making comics for myself again, I cut myself some slack and now I have fun with it. Last year you received the CXC Emerging Talent Award. I wonder if you could say a little about what it meant to you, and how you take it as a challenge going forward in terms of what you want to do and hope to do going forward. Yeah that was pretty wild! I wasn’t expecting to receive that award, so when it was announced at the festival, you can imagine my shock and utter disbelief in that moment! It’s seriously a blessing and an incredible honor to know people enjoy and recognize my work. These past couple of years have a been a real struggle balancing my career and my mentally-straining day job, so lots of sacrifices were made in order to put my art first. My work is literally my life and soul so to have someone show their appreciation of my work with an award, it’s legit proof that my art and my existence truly matter in this industry. I hope to continue living up to people’s expectations by creating more valuable work and projects for people. You mentioned quitting your day job – congrats, by the way – and that you’re planning a new anthology, but especially in light of the CXC award, is there anything you want to do differently going forward, try something else, make something longer, I don’t know. What are you working on now and thinking about for the future? Yeah after quitting my day job – thank you! – I now have time to work on my next project, my first solo graphic novel! It’s definitely a step up from my self-published mini-comics but it’s nothing drastically different from my usual work. I can’t reveal too much about it at the moment, but it’s a semi-autobiographical fish out of water story about a nerdy teen’s summer vacation in her mother’s homeland, Honduras. It’s a reflection of my own experiences spending many summers there and embarking on my own coming of age journey with my crazy family and their culture. I’m super excited to work on this project as it’s a story I wished I had growing up. For decades there has been so much negative representation about Central Americans that it’d be nice to see something positive for once, especially for countries like Honduras and El Salvador which have been marked as countries filled with violence. And more importantly, there are very few graphic novels about the experience of “ni de aqui, ni de alla” (neither here, nor there). Growing up in a multicultural setting and feeling displaced because of US Latino diaspora, this project is incredibly important for readers like myself who grew up feeling lost with their identity due to the inadequate representation of our struggles. So the thought of younger generations growing up with so many stories to read including this project, it gives me so much joy and hope! I didn’t know your were Honduran…..(my Mother-in-Law was from there…).